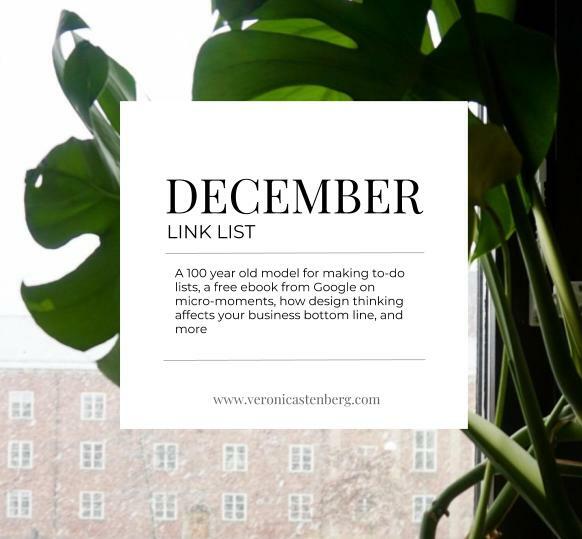 Maybe you’ll find something, learn something new or get inspired by these ten links that I found at various sources, during December. Enjoy! Charlie Williams share 10 free google tools everyone should use. Read a free ebook from Google about micro moments – its from 2011 however, it’s still a good read. Why The Convergence Of Adtech And Martech Matters – Forrester predicts and defines 5 phases. And according tom them the industry is just at it’s first phase. If you are trying to gripple with “the buzz word a jour” design thinking, here is an article from econsultancy, explaining it’s importance for your bottom line and business. In lieu of a new year ahead, what happens if you take full responsibility for your life? The Cut has a 100 year old to do list model, tried and tested! Inc has the simplest social media growth hack that most companies wont do, and it requires no software. Have you tried it? Interesting article from The Telegraph on digital partnerships – fad or way forward? Personally I think this is a way forward, in my experience it has worked well so far. The consumer behavior shaping the next generation of mobile experiences – article from Google. IFTTT – have you tried this yet?